The US is "ready to talk any time" with North Korea without preconditions, says Secretary of State Rex Tillerson. His statement appeared to shift the US position away from previous demands that North Korea must disarm before any talks can be held. But hours later the White House said President Donald Trump's views on North Korea "had not changed". North Korea's pursuit of nuclear weapons technology has led to heavy US-led sanctions against the regime. Separately, the UN's political chief Jeffrey Feltman, who recently visited Pyongyang, told reporters that North Korean officials felt it was "important to prevent war". North Korea: What could tip the balance? China and Russia both welcomed Mr Tillerson's comments. The Chinese foreign ministry hoped there would now be "meaningful steps towards dialogue and contact" between the US and the North. Russian President Vladimir Putin's spokesman said: "Such constructive statements impress us far more than the confrontational rhetoric that we have heard up to now." Diplomatic relations between the US and North Korea have been strained by recent North Korean nuclear and missile tests, and by a war of words between Mr Trump and North Korea's leader Kim Jong-un. Speaking at the Atlantic Council policy forum on Tuesday, Mr Tillerson said the US "simply cannot accept a nuclear armed North Korea". Appearing to soften the US stance towards potential future talks, he said: "Let's just meet and let's talk about the weather if you want and talk about whether it's going to be a square table or a round table if that's what you're excited about. "Then we can begin to lay out a map, a road map, of what we might be willing to work towards." But he insisted that there needed to be a "period of quiet" first, without any nuclear or missile tests. He added that economic and diplomatic sanctions would continue until "the first bomb drops", and Mr Trump still wanted China - Pyongyang's main economic ally - to cut off oil supplies to North Korea. 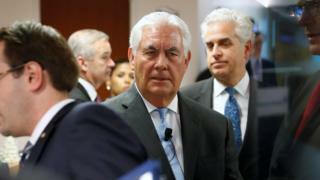 Mr Tillerson also said China had made contingency plans to accommodate North Korean refugees in the event of a conflict, a major concern for China. Why is the latest test still producing aftershocks? What did N Korea's nuclear tests achieve? Several hours after his comments, White House press secretary Sarah Sanders released a statement to reporters saying Mr Trump's views "have not changed". "North Korea is acting in an unsafe way not only toward Japan, China, and South Korea, but the entire world. North Korea's actions are not good for anyone and certainly not good for North Korea." On Wednesday, North Korean state media said Kim Jong-un had vowed his country would become "the strongest nuclear power and military power in the world". 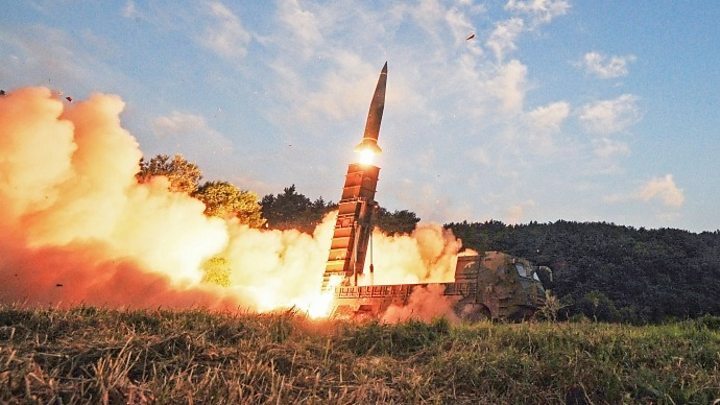 Speaking at a munitions industry conference, he cited North Korea's recent launch of intercontinental ballistic missile Hwasong-15 as a "great historic victory". The UN's Jeffrey Feltman said that while senior North Korean officials did not offer any commitments, they had agreed that discussions should continue. "They agreed that it was important to prevent war," he said, in his first briefing since his four-day trip last week. "We've left the door ajar and I fervently hope the door to a negotiated solution will now be opened wide."